The world number two, Angelique Kerber has made an unsteady start to 2017, posting a 4-4 W-L record. The German player lost her first match in Doha last week, a second loss to Daria Kasatkina in 2017, 4-6 6-0 4-6. I’ll reiterate my feelings from one of my posts last week that while I am concerned for Kerber right now, I think it’s too early to be pushing the panic button. After a bye in the first round, Kerber will play either Jelena Jankovic, who lives in Dubai, or the wildcard, Mona Barthel. Kerber is seeded to meet Caroline Garcia in the third round. The Frenchwoman has made a solid, yet unspectacular start to the year and opens in a first-time meeting with Johanna Larsson in the first match of the tournament. Separated by just two places in the ranking, Yaroslava Shvedova will play Monica Puig in the first round; Shvedova is still seeking her first singles win of 2017, while Puig enjoyed her best week of the year in Doha, reaching the semi-finals. It’s still rather jarring to see Elena Vesnina as a top eight seed in a Premier draw. Seriously though, all credit to Vesnina, who has picked up her form after a disappointing start down under but is still seeking the consistent level she produced in 2016. Vesnina will play Madison Brengle or Misaki Doi in the second round. Brengle-Doi is a classic counter-puncher vs. power striker. The Dubai courts are fast which you would think would favour Doi but Brengle was a handful to break down in Dubai last year. Doi leads the head-to-head 3-2, but Brengle has won their last two matches in straight sets. Sam Stosur enjoyed her best week in what felt like forever when she made the third round of Doha. Her forehand was working well and the rhythm seemed to be coming back after a very shaky spell since last year’s US Open. If she can get past Zhang Kai-Lin in the first round, she’ll need to be on her game to take on Zhang Shuai or Ana Konjuh. Shuai defeated Stosur twice in straight sets towards the end of 2016, while Konjuh is one of the most exciting talents on the WTA tour. Konjuh’s results though have been a smorgasbord of inconsistency; in Fed Cup action, she lost 1-6 2-6 to Timea Babos in under an hour, but on the very next day, sealed a top ten win over Johanna Konta, 6-4 6-3. Still, her game is an enigma and her name always stands out on the drawsheet. The third section of the draw could produce two matches that we have already seen in 2017 – Dominika Cibulkova against Ekaterina Makarova, and Roberta Vinci against Lauren Davis. The number three seed, Cibulkova has been improving with every tournament, but has lost three setters at her last three tournaments, all matches where she had an opportunity to get the win. One of those losses for Cibulkova was against Makarova at the Australian Open who is a projected second round opponent in Dubai. Aside from the Australian Open, Makarova’s recent results have been inconsistent, a far cry from a few years ago when the Russian player was one of the most reliable players on the tour. Roberta Vinci played Karolina Pliskova in the first week of the year in Brisbane and will now get a shot at her twin sister, Kristyna Pliskova in the first round of Dubai. Vinci won their only previous match in Prague all the way back in 2008. As alluded to above, we could see Vinci play Lauren Davis in the second round, which would be a repeat match-up from Doha. Davis comfortably saw off Vinci, 6-2 6-3 in the first round and has made a brilliant start to 2017. When combined with her equally impressive end to 2016, Davis has won 26 (!) of her last 32 matches. Elina Svitolina is a top eight seed in a Premier draw, which is likely to become a regular occurrence in the years to come. Svitolina has made a decent start to the year; she notched up another win over a (then) world number one, Kerber in Brisbane and won her fifth title in Taipei City, producing two commanding performances in the final two rounds. It’s a good start for Svitolina, but she is still yet to make that step forward in replicating these types of results at Premier events and beyond. This is a good draw to make some progress on that front in Dubai and first up will be Lara Arruabarrena or Zheng Saisai. The big talking point from the fifth section is a first round match-up between Doha quarter-finalists, Caroline Wozniacki and Daria Kasatkina. The rising Russian has played the majority of the top 20 now but Wozniacki, who reached the final in Doha, remains a player she’s yet to face on the tour. Perhaps the slightly underrated storyline is that this is a favourable draw for the number five seed, Garbiñe Muguruza. While Wozniacki and Kasatkina are both tricky opponents, their exploits in Doha may provide Muguruza with the springboard to go deep in Dubai. In first round action, Kateryna Bondarenko will be aiming to snap a three match losing streak against Aryna Sabalenka while the wildcard, Cagla Buyukakcay will take on Viktorija Golubic. The latter is an important match-up as both players will be gunning for their first singles win of 2017. In her first match in Dubai, Agnieszka Radwanska will play Tsvetana Pironkova or qualifier, Elise Mertens. Both players could cause some problems for a vulnerable, Radwanska. Pironkova defeated Radwanska at last year’s French Open and took a set off her in the first round of the Australian Open, while Mertens is enjoying what looks set to be her breakthrough year on tour. The Belgian player has already won 14 matches in 2017 and successfully qualified for three WTA main draws. The newly promoted number 17 seed, Yulia Putintseva will open against CiCi Bellis. The 17-year-old American made her comeback in Doha after skipping the Australian summer of tennis due to a hip injury. While she did lose her second qualifying match to Zheng Saisai, she had taken out the in-form, Peng Shuai in her first match. Putintseva has shown flashes of brilliance in 2017, reaching a first WTA final in St. Petersburg – Belis v Poots will be a very intriguing match. The winner gets Laura Siegemund or Silvia Soler-Espinosa in the second round. Siegemund appeared injured in Doha and is still searching for her first singles win of 2017, currently in the midst of an eight match losing streak. Following Johanna Konta’s withdrawal from the draw, Barbora Strycova was bumped up to the number nine seed. She will play Lesia Tsurenko or Peng Shuai in the second round; neither will be easy with Peng in good form in both singles and doubles and Tsurenko, when not injured or ill, proving to be more than competent. Her only loss of the year so far has come against the then world number one, Kerber. The courts though suit Strycova’s game after she reached the Dubai final in 2016. Vandeweghe follows up her Australian Open and Fed Cup exploits with a first round match against fellow American, Alison Riske. This will be the pair’s eighth (!) clash with Vandeweghe currently leading the head-to-head, 4-3. The winner will then take on Irina-Camelia Begu or Anastasija Sevastova in the second round. Between them, the pair have mustered up just four wins on the tour in 2017. Karolina Pliskova, the Doha champion, bookends the draw and will start with a challenging opener against either Kristina Mladenovic or Katerina Siniakova. Pliskova has been superb so far in 2017, winning 15 of 16 matches and serving especially well in Doha. The number 14 seed, Anastasia Pavlyuchenkova opens against Ons Jabeur which feels like a potential banana skin match. Pavlyuchenkova could play Jelena Ostapenko in the second round; the Latvian player has blown hot and cold in 2017 so far which is nothing new! She made a bright start in Auckland, reaching the semi-finals, and nearly claimed the best win of her career against Pliskova at the Australian Open before an attack of nerves. A first round loss to Donna Vekic to St. Petersburg, including a bagel, was a surprising result. If she can get past Wang or Pavlyuchenkova, she could get another shot at Pliskova in the third round. Of the 16 seeds in Dubai, nine of them did not play Dubai in 2016. 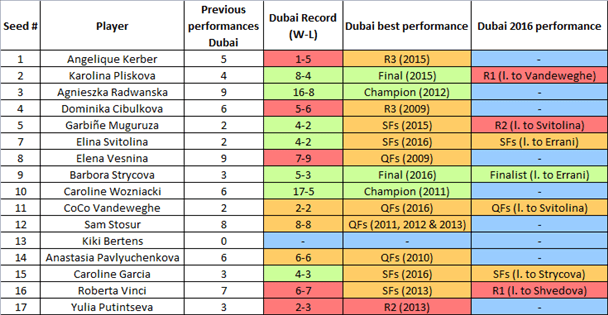 Much like Doha, Kerber has a dreadful record in Dubai with just one match win (d. Kuznetsova in 2015). Dominika Cibulkova and Anastasia Pavlyuchenkova have both lost their last four matches in Dubai. For Cibulkova, she hasn’t played this tournament since 2013 and her last three losses were against now retired players (Petrova, Melzer and Wolfe). On a positive note, Caroline Wozniacki has the best record of the 16 seeds being one of two former champions in the draw – Radwanska is the other. Aside from her first appearance at this tournament in 2010, Wozniacki has never failed to reach at least the semi-finals. Caroline Wozniacki v Daria Kasatkina: Loving this match-up and anytime we get to see Kasatkina go up against a player for the first time. Their respective efforts in Doha could have an impact on this match-up with both having endured physically demanding weeks in Doha. 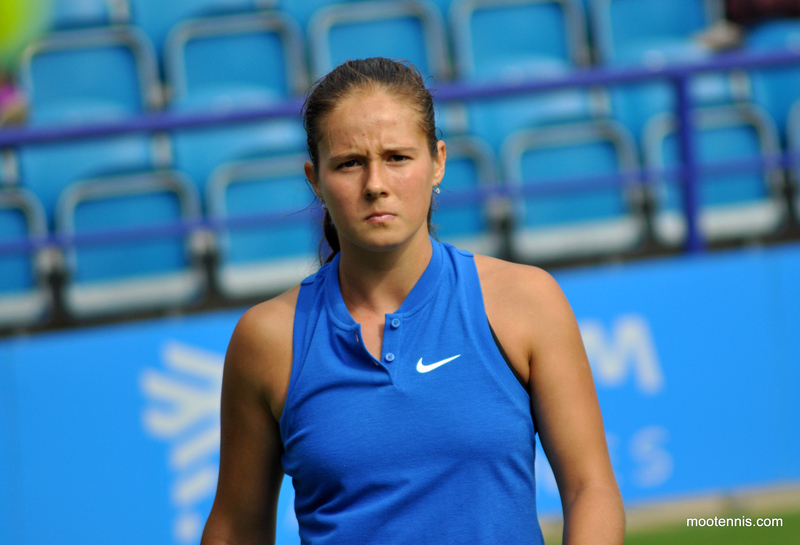 Heart says Kasatkina, head says Wozniacki. Kristina Mladenovic v Katerina Siniakova: A brutal first rounder between two players who won their first WTA titles in 2017. Siniakova has won just one match since winning Shenzhen and is currently in that awkward ranking where she’s missing out on seedings. Mladenovic was poor up until St. Petersburg where she came alive and played some wonderful tennis. Siniakova leads the head-to-head, 2-0 including a 6-1 6-1 victory (!) in Moscow in 2014. Instinct is going for Mladenovic though with her recent boost of confidence. The first quarter is a free-for-all with the seeds, Kerber, Vesnina, Stosur and Garcia all being somewhat vulnerable. I’ve gone for a Kerber v Konjuh quarter-final, probably because it is a match-up that sounds like bundles of fun! I’ve actually picked Konjuh to the semi-finals which is wild for me. In such a wide open quarter, I felt it was worth a risk. I’d fancy (and also hope) that Kerber can score some wins in Dubai but it’s hard to see her staying in until next weekend based on her recent form. The potential Cibulkova-Svitolina quarter-final is a key area of the draw and one that I think will produce our finalist from the top half. I’ve been coming round to Svitolina over the past year and I feel she might be ready for the next step. I remain a little uncertain about Cibulkova and her nature to freeze in three setters this year. My only worry for Svitolina is if she were to run into Osaka in the third round. I’m super keen on Muguruza’s draw as I think Wozniacki/Kasatkina will be unlikely to back up their runs in Doha. I’m not set on Radwanska this year and would fancy a Muguruza to get the better of the Polish player if they were to meet in the quarters. I’m on the fence with Pliskova in Dubai – the injection of pace on this court compared to Doha might give her a boost and a chance to fly through some matches but the draw isn’t easy at all. Who do you think will win Dubai? As always, comments are appreciated! February 18, 2017 in Dubai, Tournament Preview, WTA. I honestly have no clue who will win this tournament. It’s so much more difficult than like 5 years ago. I would hope for Muguruza to win it, but I don’t see that happening. But who else…? I fancy Svitolina to win the title. I did take your hint about and picking Wozniacki over Radwanska in Doha So, I’m back this time to see what’s up :D.
My take away from the Doha final: Wozniacki did not appear sincerely happy about that loss to Pliskova. I think she means revenge whenever it is they meet again. Also, I keep picking Kerber deep and getting burned. But not sure I’m bold enough to pick Konjuh over Kerber….maybe. It’s a thought. Gosh, Dubai is more confusing than Doha! I do have Svitolina over Kerber and Karo Pliskova over Svitolina — which sounds super-human looking at Pliskova’s draw. Having her lose to Muguruza….that’s a thought. Anyway…thanks again for your good work and tips! And once Sharapova comes back she is going to mop up the floor with all these ladies. I cannot wait for that. This is the weakest the WTA Tour has been in my lifetime and as long as Maria was close to her old level she will easily mop the floor with the current field! Infact, she is my prediction to win the French Open if she gets into the draw (assuming she wins a few matches in Stuggart and Madrid). I disagree. I think the WTA is much stronger than in 2008-2012. Not at all. 2012 was my favourite tennis year in this decade so far. The consistency from the top players was amazing (Williams, Azarenka, Sharapova). 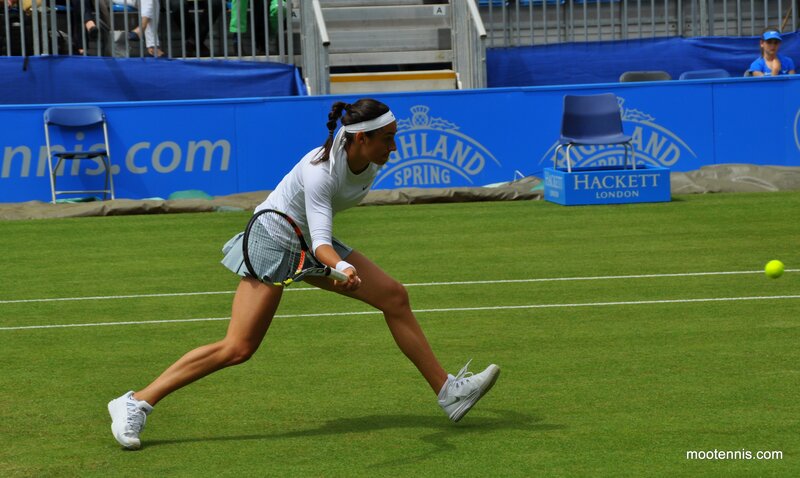 It was also great to see some new players with different, unique styles to get on top (Radwanska, Kerber, Errani). Today there is so much more inconsistency, so how could it be a stronger era today…? 2012 improved when Serena began her resurgence. I’d say that Jo Konta and Karolina Pliskova have been at least as impressive so far this year as Azarenka and Sharapova in 2011/12. Since 2014/15 most of the WTA top players always have their lows in each season. I think there are a lot more injuries in tennis nowadays and that inevitably means that players aren’t able to play their best tennis throughout a season. For example, Simona Halep is forced to sit out several tournaments, in which she would be expected to play well, because of a leg injury. Similarly, Carla S-N wasn’t able to defend her title in Doha because of an injury to.her shoulder. Notwithstanding that though, it seems to me that the general standard of play in women’s tennis is higher now than it’s ever been before. It may be true that there are fewer truly great players now – the likes of Billie Jean King, Marina Navratilova and Steffi Graf – than there used to be, but there are a lot more very good ones. Maria said recently that there aren’t any easy rounds in tournaments, especially the big ones, any more, and I think she’s right. It wasn’t that long ago when following the first week of Wimbledon was pretty much a waste of time because it was rare for top players to lose then; that’s certainly not true now, or of any of the other slams too. It’s very open nowadays, and I think that’s a good thing for the sport. Good example Ons Jabeur(172) beats The Pav(23) in the first round, as suggested by The Moo.